There’s usually a few heavy downpours between January and March. Those chilly rains soak the frozen earth all afternoon and into the night, and the cold, clammy night air begins to warm ever so slightly, the temperature rises above 40 degrees (F), and the first amphibians respond. While we’re snuggling up to the wood stove on a stormy night listening to the cold rain splatter against our window panes, out of the torpid dormancy of winter’s dark depths, they emerge with hormones pumping – crawling and slithering – flowing with the newly moving waters. We call these the salamander rains. It is during these chilly downpours that the spotted salamanders come a courting. These impressive critters are six to nine inches long, blue-black in color with orange and yellow polka dots. They crawl out of the forest duff and head downhill. They congregate in low swampy areas searching out vernal pools (Vernal pools are pools that are full of water in spring but are usually dry by late summer. Because they dry up part of the year they are free of predatory fish so they provide safe nurseries for tender, young larval salamanders.) Once the adult salamanders arrive at the pools, they enact ancient courtship rituals–and what a thing to witness! A short time later (a few minutes or perhaps as long as several days), the females arrive at the sperm littered “congress area”. Each female straddles a spermatophore and lowers herself onto it, taking it into her body, transferring it to her oviducts, pinching it off with the lips of her cloaca. Sometimes in a cold wet swamp at night I think I can almost hear them–the snapping lips of little salamander cloacas (or more properly, cloacae) as they pinch off those spermatophores. What a romantic and beautiful sound! The next rainy night a week or so later we returned to the same area and saw females in the deeper parts of the pools clinging to sunken twigs depositing eggs. Spotted salamander egg masses are jellylike globs usually about the size of tennis balls, often containing a hundred or more eggs. 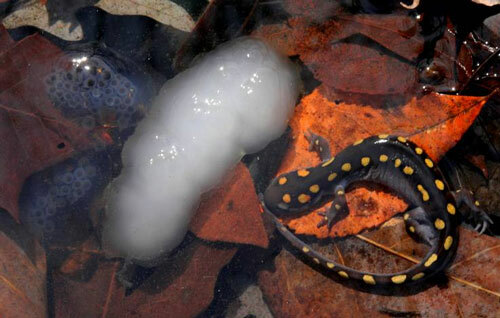 Spotted salamander eggs are distinctive because many (but not all) of the egg masses are an opaque milky white, giving the mass a cottony appearance other egg masses are clear and resemble other gelatinous amphibian eggs. Now is the time to get ready for the big event. Put on your rubber boots and scout out your nearby wetlands, look for pools in swampy areas at the headwaters of lakes and wet overflow areas along the flood plains of creeks and rivers. Then when the rain starts one afternoon and continues pouring after dark, and the temperature is in the forties, put on your rain gear. Grab a strong flashlight and head out and join the party. Some say that if the flashlight has a red lens it creates less disturbance to the festivities, though I have not noticed much difference when I tried. Lemmie know what you see. I’ll be writing more about wood frogs, peepers, and about some wild times we’ve been having in our back yard newtist colony, so stay tuned. Just found a spotted in my back yard moving slabs of stone, took a couple of pictures and a video and gently put the stone back… I never saw such a big salamander before, it was pretty cool. Very nice article. Few people know of the salamander rains. I have yet to see it but it’s on my bucket list! Such an appropriate, romantic story for Valentine’s Day. We enjoyed it so much – thanks. I found a salamander rains down in my basement a few moments ago. I found a large spotted salamander inside of a cardboard carpet roller in my virginia basement. He was very cool looking , I just let him go about his or her business as the awesome creature seemed to be very healthy and enjoying where it was. I have not seen it since, it must come and go as it likes.